Model SD hydraulic torque wrenches use standard square drive power sockets* to help you torque industrial size bolts on heavy equipment. The offset drive-head is designed with the smallest possible head radius for use on close clearance jobs such as API and ANSI flanges. Torque reaction is accomplished by placing the built-in steel reaction arm against any adjacent rigid structure. Custom reaction arms are available to accomodate most applications. You'll save time and money using these versatile and compact tools to torque any nut or bolt from 3/4" to 6" in diameter. We manufacture a variety of hydraulic torque wrench systems, ranging from those capable of supplying up to 200,000 Ft-Lbs of torque, all the way down to systems supplying 200 ft-lbs of torque. Operation is simple! One worker can position the wrench on a bolt head and operate the control valve on the torque wrench. The hydraulic cylinder rod strokes out and turns the fastener 15° each cycle. Separate electrical control pendants are not used. When the control valve is released, the load is removed thus allowing the wrench mechanism to ratchet in preparation for the next stroke. The open center valving in the wrench precludes ever "hydraulically locking" the the wrench onto a nut or bolt. To loosen bolts, the tool is simply turned over. From the Model SD-1.5 on up to the Model SD-200, you get BMF quality and engineering built-in. Torque output is accurate within ±3%. BMF Torque Wrenches are stronger. Our unique and simple ratchet design engages all 24 ratchet teeth at one time. Therefore, the torque load is distributed over all the ratchet teeth instead of high loading on 1 or 2 teeth as in other ratchet wrenches. There are no pins, no pawls, and no levers in our ratchet to break or wear out. In fact, we warrant our ratchet mechanism for a full 3 years. BMF Torque Wrenches are safer. Only the worker who positions the wrench on the bolt controls its operation . Nuts and bolts are made up quicker and more safely because the time and the risk of coordinating the efforts of a 2-man operation is eliminated. Most of our wrench Models require only 3000 PSI to produce maximum torque, compared with the 10,000 PSI required by other maker's designs. Lower pressure means lower hazard for your workers. BMF Torque Wrenches are more reliable. Our wrenches are designed with simplicity in mind, incorporating as few moving parts as possible to limit points of maintenance. We manufacture our wrenches from either heat treated chrome-moly alloy steel, or high strength 7075-T6 aluminum, imparting quality and longevity of service into every wrench we sell. Our low pressure hydraulic systems are inherently more reliable than high pressure systems. All of these features combine to give you a hydraulic powered torque wrench system that can safely, reliably, and easily torque industrial size bolts. Model SD Torque Wrenches are available with Hex Drives to fit directly into Hex Socket Cap Screws. Other options include remote control valves, and models for subsea service. Ask us if you have a specific requirement, we can most likely meet it. BMF stocks large power sockets for virtually any size inch or metric, 6 or 12-point bolt heads. If we don't have it, we can make it for you. 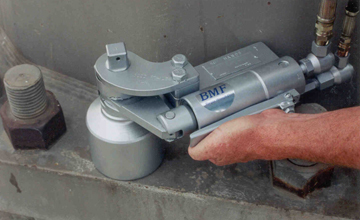 In addition to the standard line of hydraulic torque wrenches listed above, BMF Torque Wrench Co. offers hydraulic torque wrench designs which can torque bolts in applications where access to the bolt is limited due to design requirements or surrounding objects. We also offer hydraulic torque wrenches for use in subsea operations, as well as hydraulic torque wrench systems which can be remotely actuated. Also available are integrated Hex Drivers for applying torque to socket head cap screws. Contact us to discuss your particular requirements. Choose a BMF Torque Wrench when you want to safely, quickly, and reliably torque large nuts and bolts.